With the explosion of digital technology, software, apps and the internet of things (IoT), have come a seemingly endless amount of online accounts. The average person now has 93 online accounts from different providers and platforms. Each of these providers, platforms and apps carry their own terms and conditions that apply to your user account on the 3rd party platforms. If you have any important, sensitive or important data, documents, images, financial or other information in ANY of these online accounts, you simply MUST consider them to be part of your digital estate plan or general estate plan if you already have an existing estate plan or other trust documentation. 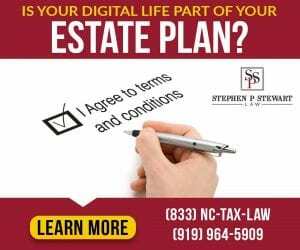 Digital Estate Planning is a new frontier practice area that Stephen P. Stewart is pioneering in his Business, Tax & Estate Planning Law Practice. If you have any of the following accounts or types of accounts, you should consider retaining Stephen P Stewart Law to update your estate plan with a Digital Estate Plan that works within your current and future plans and wishes. Online account access and privacy are NOT guaranteed upon your passing. The terms and conditions of these accounts will prevail UNLESS you have a properly constructed Digital Estate Plan. Did you know that you have a digital estate? You may think you don’t, but if you are reading this blog you probably do. What is your digital estate? Similar to your “traditional” estate, your digital estate is comprised of the digital assets you own. Online Accounts: email and communications accounts, social media accounts, shopping accounts, money and credit accounts such as PayPal, bank accounts, loyalty rewards accounts, photo and video sharing accounts, video gaming accounts, online storage accounts, and websites and blogs that you may manage, including any content you’ve posted to those sites, any communication and correspondence made through and stored on those sites, your personal information, credit card information, purchase and browsing history and any credit you may have and the information necessary to access those accounts. Intellectual property: including copyrighted materials, trademarks, and any code you may have written and own. How many of these digital assets do you own? Stephen P. Stewart, J.D., LL.M. (Taxation) is Of Counsel with the Raleigh law firm of Harris & Hilton, P.A. Stephen has practiced law in the state of North Carolina for over 25 years concentrating in the areas of business, estate and tax law.